1. 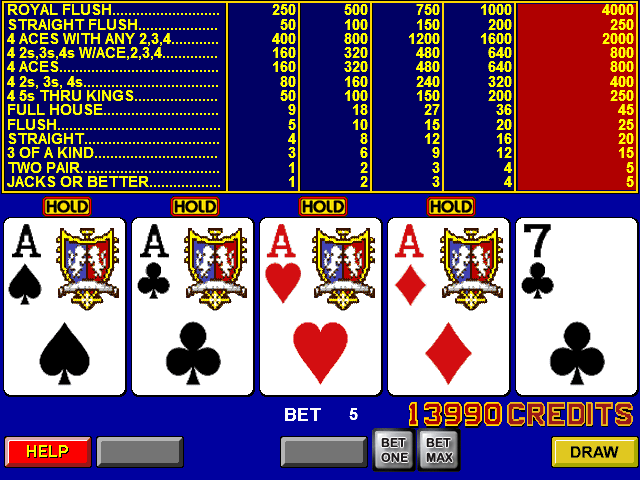 What is the best video poker game to play (deuces wild, jacks or better or some other) and what soft is best. 2. Is there any strategy for playing it? At WizardOfOdds site you will find all you need including strategy, odds and estimated RTP's for different rules. I prefer deuces wild with joker) You get something al the time. Ant the main thing is an oppotunity to double up winnings. I have played videopoker only once and offline. I played 10 games with maxbet and got the maximum possible win on a last hit, that is truth) It was four aces with something, I got 80k crowns. Playing common rules Jacks or Better with basic strategy gives you 99.64% RTM. More then most of slots. videopoker is boring, well it might be interesting for someone who's oldschool gambler. I know for a fact, that a lot of casino promotions abusers like videopoker games, as they give really high RTP. U r right. With some rules using a special strategy you may get positive RTP there as I know. I guess you may get positive RTP only playing offline videopoker. Old Bally's machines and some others.